Who is the Votescam Syndicate? 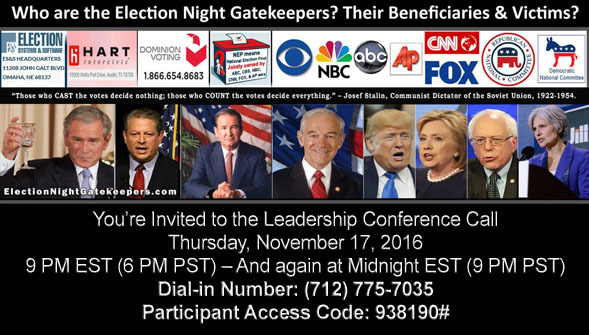 Who Are the Computerized-Election-Fraud Players, The Election Night Gatekeepers, the Votescam Syndicate? The following four groups are perpetrating a computerized Election Fraud conspiracy upon America. Election Systems & Software (ES & S) Hart InterCivic, and Dominion (which bought Diebold & Sequoia in 2013). These are the three mysterious mega-corporations which have been hired by the overwhelming majority of counties in the USA to process our ballots on election night. The 2004 article in the Nation Magazine by veteran reporter Ronnie Dugger, entitled “How They Could Steal the Election this Time”, stated that 96% of the US vote on election night was counted by these three companies, and that 60% was counted by ES &S alone. (!!!) You can read the entire article by Dugger at the link immediately below, but at least read the shocking first few paragraphs when you have a chance (remember that in 2004 there were FOUR major election vendors as Dugger describes; in 2013, Dominion bought both the infamous Diebold election division and Sequoia – and then there were three) . Here is the link to the entire 2004 Nation by article:https://www.thenation.com/article/how-they-could-steal-election-time/Several concrete examples, Hamilton County (Cincinnati) is using Hart Intercivic; Butler County, right above Hamilton County in Ohio is hiring ES & S to process the county elections on secret software programs which the election officials sign contracts that they are not allowed to inspect. (!!!) It seems that ES &S runs all of the elections in South Carolina, and apparently all the elections in Oregon circa 2014-2016.Please note: Just as Voter News Service changed its name (and nothing else) to National Election Pool in 2004, when the VNS name became too stinky, the same is happening to camouflage how few companies process our votes on their secret computers. Now, by 2016, smaller satellite companies, such as Triad circa 2008 in Ohio, have popped up here and there from time to time to try and throw dust in the public’s eye. Please note: all these allegedly “new” companies all use the same motus operandi as the Big Three: secret software that no one, not even the Election Officials, is allowed to inspect. One could suspect that all of these mega-companies and their satellites are the SAME company behind the scenes, funded and erected by the dark side of the world’s money-issuing entities (such as the dark side of the FED, Goldman-Sachs, the IMF, etc) and operated by the dark side of military intelligence. This would ensure, as long as we allow it to exist, that the current Ruling Elite stays in charge o the direction of the USA and the world, no matter what. — The answer is for each county to FIRE all of these mega-Election Vendors and their secret software, and restore hand-counted paper ballots in each neighborhood precinct — counted right at closing time with all factions invited to observe the counting in an orderly manner, with all ballots counted BEFORE they leave the public sight. )To repeat myself to some extent: these mega-Election Vendor companies are completely out of reach of any oversight by the voters and the public. It is this aspect of the current election situation which caused me to say that my explanation here is slightly over-simplified. These companies are always buying and selling each other, and using smaller front companies in some areas. When Diebold’s CEO made an incautious statement about helping W. Bush get re-elected in 2004, a small company called Triad popped up in Ohio to take over some of the counties. We have already covered that, after years of rumors, a new player called Dominion bought the election division of Diebold and Sequoia. In any case, DO NOT BE FOOLED by this game of musical chairs played by the Super Rich who own all of these mega-election companies. Even though we carried the link above to the entire 2004 Nation Magazine article above by Ronnie Dugger (How They Could Steal the Election this Time), this claim that 99 % of our counties were in the clutches of basically four (now become three) mega-computer-elections-corporations by 2004– is so “unbelievable” at first glance, that I’m going to include a few paragraphs Dugger’s 2004 article in right here. “On November 2nd millions of Americans will cast their votes for President in computerized voting systems that can be rigged by corporate . . . insiders. . . . The potential for fraud and error is daunting. About 61 million of the votes in November, more than half the total, will be counted in the computers of one company, the privately held Election Systems and Software (ES&S) of Omaha, Nebraska. “Altogether, nearly 100 million votes will be counted in computers provided and programmed by ES&S and three other private corporations: British-owned Sequoia Voting Systems of Oakland, California, whose touch-screen voting equipment was rejected as insecure against fraud by New York City in the 1990s; . . . Diebold Election Systems of McKinney, Texas, whose machines malfunctioned this year in a California election; and Hart InterCivic of Austin . . .
Dugger’s entire article is linked also on the right side of the home page at www.votefraud.org — along with a number of other absolutely critical historical articles. The sin of the local election officials, both Republicans and Democrats, is that they have stepped aside and illegally and unconstitutionally delegated the processing of our elections to the four major corporations (now become three) named above in Dugger’s article. PHONY PUBLIC OPINION POLLS and BLATANTLY BIASED TV COVERAGE. For MONTHS AND MONTHS before a Presidential election, the Major TV Networks issue endless public opinion polls, provided by the FEW polling companies they pay, such as Zogby, Gallup, and their own in-house polling operations. NO ONE, and I mean, NO ONE in the major media at any level ever questions who does these polls, and how they are done. I believe they are deliberately falsified whenever so desired to manipulate public opinion, rather than to reflect it. The case of the Jail for Judges Amendment contest in South Dakota in 2006, proves beyond a shadow of a doubt that these large “Big Media Approved” polling operations falsify and withhold information from customers when ordered to do so. But that’s a story too long to go into here. For instance, in 2000, ALL FIVE Big TV networks touted daily polls that indicated the contest was a dead heat between W. Bush and Al Gore, 49% to 49%, and so on; day after day after day after day. Never included in the polling questions were Reform Party candidate Pat Buchanan, or Green Party candidate Ralph Nader. These two articulate advocates, whose careers and life work were supported by millions of people – were excluded from all these daily Big Media polls. This tactic – enforced uniformly by ABC, CBS, NBC, CNN, and FOX – gave the impression to the public that the only candidates that had a chance were the lackluster Bush and Gore. (If you’re getting the impression that I believe the Big Five TV Networks coordinate their news everyday – you are correct. They coordinate what to cover, what to censor, and from what angle to cover each news item. On many secondary issues, FOX is allowed to take the opposite view of MSNBC or CNN in order to keep the public bickering over what are usually non-essential and trivial points. Also in the 2000 Presidential race, the RNC and the DNC, in conjunction with the smiling approval of the Big Five TV Networks later made up rules to exclude Patrick Buchanan and Ralph Nader from the debates – even though it was inclusion in such debates that catapulted Jesse Ventura to prominence in the race for Minnesota Governor in 1998. Pat Buchanan commented that he was being kept on the sidelines in the heavyweight fight for which he had trained all his life. Ralph Nader crashed the debate premises in protest, and was arrested. This “public opinion poll” tactic is the way the Big Five TV Networks, in unison, prepare the American public for the “winner” of each major party nomination, and ultimately of the next Presidential election. These same Big Five TV Networks, in conjunction with their progression of “public opinion polls”, assault the public with blatantly biased coverage of political races. In the 2008 Democratic Presidential Primaries, Barack Obama was treated as an unquestioned front runner from day one, while the Democratic Vice-Presidential candidate from 2004, Sen. John Edwards, was virtually censored from the news. At the same time, Congressman Ron Paul was treated as an intruder who did not belong in the race at all. Paul’s supporters were treated as virtual nut-cases who might be dangerous to the country. Paul was attracting large crowds despite the all-out assault against him by the five Big TV Networks and big talk show hosts like Hannity and Limbaugh. Paul would attract crowds 10 to 100 times larger than all the other GOP candidates put together – and all Big Five TV networks would fail to report this in perspective. In late March, 2012, “front runner” Mitt Romney rented a stadium in Michigan that held 30,000 people – and attracted a crowd of 1200; this with an all-out effort by much of the state GOP and after months of shameless promotion by the Big Five TV Networks. In April, 2012, after months of being attacked and censored by the Big Media, Ron Paul attracted 3,000 in North Dakota, 5,000 in LA, and 7,500 people at Berkley, California. The Big Five TV Networks CENSORED all of these gigantic outpourings of support for Ron Paul – it might give the public the idea that he was the real front runner, which was NOT the narrative the errand boys for the big-money boys at the Big Five TV Networks were supposed to be communicating. This blatantly biased coverage by the Big Five TV Corporations amounts to “in kind” donations to the campaigns that benefit. Billions of dollars of “Big Media” publicity have gone in 2008 and 2012 to treat McCain, Romney, and Obama as very serious political personages, while simultaneously Ron Paul has been ignored, censored, ridiculed, and sometimes vilified. (The same happened to Pat Buchanan in 1992, 1996, and 2000. “Phase one“ is the issue of endless “public opinion” polls to manipulate and form public opinion, and to provide blatantly biased coverage, which amounts to psychological warfare against the American people. PHONY EXIT POLLS. All exit polls reported by the Big Five TV networks are conducted by National Election Pool (NEP). 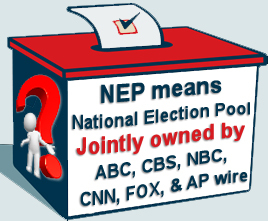 As stated above, NEP is jointly owned by ABC, CBS, NBC, CNN, FOX, and AP wire. So, all of the pretended “competition” between the major TV Networks to call the “winners and losers” on election night – has been a total hoax. The networks have always been getting the exact same “exit poll” information at the exact same time – from the exact same corporation, which these media giants JOINTLY own. We have closely monitored and documented three highly questionable exit polls since 1979. One happened in northern Kentucky in the 1990s. We got there about 5 PM with HUNDREDS of people standing in line waiting to vote. But (then) VNS (Voter News Service) had already left to call in their results. The second exit poll (actually an entrance poll) we ran into was in Dubuque, Iowa on the night of the Iowa caucus, February 12, 1996. VNS (now NEP) had hired three college students who interviewed about 30 people and called in their results 6:50 PM; ten minutes before the Caucus began, and as 95% of the 2000 participants were arriving to the local Caucus at Hempstead High School that night! The third fraudulent exit poll we found was at Manchester High School in Manchester, New Hampshire on February 20, 1996. We were present for this one all day. The lady hired by Voter News Service (now NEP) candidly told us that the exit pollsters arrive at 10 AM, missing the morning rush hour for voting. They stop their exit polling at 5 PM, and begin calling in their results, thus missing the evening rush hour for voting. We filmed the lady calling in her results to New York City at a pay phone – with literally HUNDREDS of voters walking past her between 5 and 7 PM. This lady also told us that only 1 out of 15 voters will take time to talk to the exit pollster. People are busy, have to get to work, have to drop off or pick up their children, etc. etc. etc. So where is the scientific basis for such exit polls, purportedly able to help call races to the percentage point? Answer: there is no scientific basis for these exit polls. They are essentially a hoax, and cannot possibly do the job the Big TV Networks have claimed they do for the last 35 years or so. In the book, Votescam: The Stealing of America, the Colliers devoted chapter 15, Piece of the Puzzle, to the subject of exit polls. To recap, “phase one” is the months of endless, dubiously conducted public opinion polls“, and prolonged, weighted Big Media “news” coverage. Phase two is the election day “exit polls” conducted by NEP for all Big Five TV Networks (who pretend to be in competition, when they are not) – which exit polls have one purpose: to prepare the public for the computer results to be announced a few hours later. EASILY RIGGED COMPUTER RESULTS. The local county, with the full encouragement, and perhaps under the pressure of, the RNC and the DNC, turns over its entire election process to one of these sinister mega-corporations, just as occurs in my own Hamilton County, Ohio which has turned the handling of its election process over to Hart InterCivic in 2010 and 2012.
. . . and see the sworn testimony, submitted to the Common Pleas Court of Judge Richard Niehaus of Hamilton County, Ohio by Computer Scientist Robert Strunk of Xavier University in Hamilton County, Ohio in 1985. This expert testimony was given under the authority of a court order issued by Judge Richard Niehaus which authorized experts designated by plaintiffs (our Citizens for a Fair Vote Count supporters) to “observe all phases of the election process” and report back to the court. Attorney James Condit Sr. litigated this public interest lawsuit from 1981 to 1985, and ultimately obtained a favorable court ruling against the Board of Elections in Cincinnati in 1985. Computer Expert Robert Strunk gave some of the most devastating testimony ever to appear anywhere in his report to Judge Niehaus’s court. Strunk stated that the Hamilton County Board of Elections was accepting the election results “on blind faith.” This Strunk testimony inspired key parts of Dr. Philip O’Halloran’s excellent Relevance Magazine article, found at votefraud.org (Pandora’s Black Box: Did It Really Count Your Vote? ), especially the sections regarding easily accessed modems in computerized voting machines. LOCAL RESULTS ARE SECRETLY CHANGED. Listen up! This is what happens next: The mega-election-computer company, since they completely control the software, can then monitor how the elections are going via cell phone, satellite, or other sophisticated technologies, and then change the election results during the election day and/or on election evening – without the knowledge of local people sitting a few feet from the actual local election computers in each county. Free-lance investigative reporter Christopher Bollyn provided an eye-witness report in Cook County, Illinois on election night 2004. He observed the AP Wire reporter reading a novel while her computer was hooked up to the mainframe election computer providing the Associated Press (AP) with real time access to the computer count. See “How a Private Company Counts Our Votes on Election Night” linked on the home page of www.votefraud.org. The HBO documentary, Hacking Democracy, focuses on the excellent work of Bev Harris, who founded www.blackboxvoting.org. Her entire book, Black Box Voting, is online at this web site. The only comment I feel I must offer about this book is that there is a part of Hacking Democracy where the viewer new to this subject might get the impression that the “Bush Family” or the “Republicans” control the electronic voting machines, and used them against John Kerry in 2004. As can be seen from the perspective of 2012 and beyond, it should be clear that the explanation found in this chapter gives the correct explanation: that the National Democratic and Republican Committees are largely two masks for the same Ruling Elite power coalition. The RNC and the DNC have become “two wings on the same bird of prey” to use Pat Buchanan’s phrase, or constitute a completely spoiled system to use the phraseology of Ralph Nader. Two other internet resources worth mentioning specifically here are www.TheLandesReport.com and VotingSecurity.htm where you can find the excellent work of independent reporter Lynn Landes, and www.bradblog.org where you can find a blizzard of updates on the computer vote-fraud issue from week to week. Don’t forget to look into the original full-length book, “Votescam: The Stealing of America”, by James and Kenneth Collier, 1992 and the more recent, “Hacked! 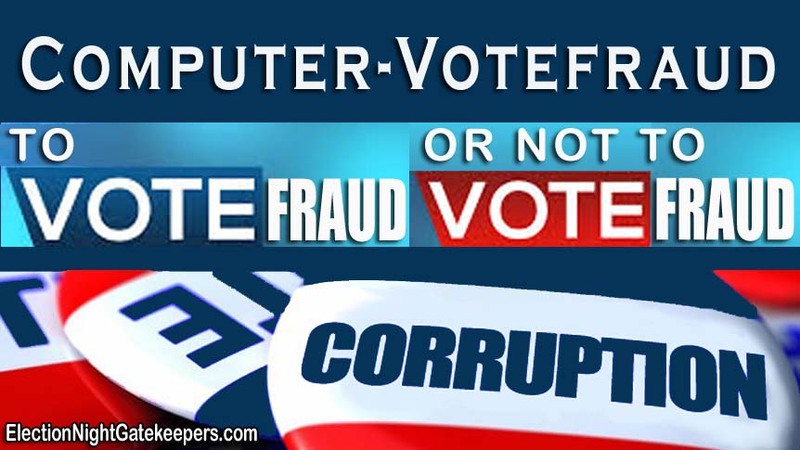 High-Tech Election Theft in America,” by Vickie Karp. The reader might also want to check out the link about vote manipulation in my congressional race against John Boehner in 2010 in the 8th District of Ohio. The link is found near the top of the home page at www.votefraud.org. The screen shots which author and investigator John Weiskittel captured on that election night show that all evening I was running in second place to Speaker of the House John Boehner, defeating the Democrat and the Libertarian. With 100% of the precincts reporting, at about 12:30 AM EST on Wednesday morning, Boehner was credited with about 140,000 votes by the computers. I received 36,202 as the Constitution Party candidate. The democrat was credited a few over 29,000 votes, and the Libertarian candidate with a little over 4,000 votes. These percentages were run throughout that election night on the websites of two major networks and their local affiliates, as well as on the on live TV reports on CNN, NBC, and MSNBC (as scrolls across the bottom of the screen), as well as on local TV affiliates in Cincinnati, Ohio and Dayton, Ohio, where Boehner’s district is located. Then, Presto!, at 12:50 AM EST – 20 minutes later, 33,000 votes were subtracted from my totals, and added to the totals of the democrat. Now I was in last place, and the Democrat in second place, just as those running the computers in New York City wanted you to believe. Even the next morning, the Cincinnati Enquirer carried my final totals as 36,202 votes. The crass change had been made when someone in Cincinnati or New York City noticed that the original results were “unacceptable.” You can see the screen shots at the link mentioned above. On that same November election night of 2010, the GOP – and Tea Party backed – candidate, Sharron Angle, was defeating the Democratic candidate, Senate Majority leader Harry Reid, in the race for Nevada US Senator. Angle looked like a wholesome woman in her forties, and Reid looked like a walking corpse, but the normal rules of television appearance, we are supposed to believe, don’t apply when the Ruling Elite is trying to preserve one of their key puppets and henchmen in power. There is no chance to get rid of the domestic enemies who are increasingly “elected” to Congress, and who are sometimes since 1988 “elected” to the White House, until we get rid of easily rigged election computers, and restore honest, openly counted elections, at the neighborhood precinct level, once again. A myriad of other sources and articles are at www.votefraud.org, especially down the right hand side column on the home page.